, writes the story about her daughter, coming home from school in early December, telling her mother she got one of the great parts in the Nativity Play. Children know how to grasp the essential, don’t they? While we labour trying to keep up with our schedules (and our neighbours! ), we often forget what’s truly important. Once again, a child shall lead us. But do we want to be led? Have we lost our sense of wonder? I recall going to a beautiful reserve forest a few years ago. It was thrilling to look out for monkeys, birds, the Malabar squirrel and elephant herds. Imagine our dismay, when a group of tourists walked by, talking loudly and attempting to take photographs of themselves and being worried about their hair flying in the wind! I see people going for walks talking away on their mobile phones. What could be so important, I think? Remember, the quintessential Japanese tourist who supposedly went all over snapping up pictures to view and show back home? The sad news is that now he’s all of us! We’re too busy snapping pictures for our blogs and Facebook pages to really enjoy the beauty of Nature or feel a sense of wonder at an ancient monument. Today, I want to pledge to find my sense of wonder again. Will you do that too? Happy to be linking in with The 1Word Blog Challenge. Held every Wednesday – the words given were ‘lost’ or ‘truth’. I chose ‘lost’. Maybe next time we should issue every experienced person either a second identity or a newbie to chaperone and to let the wonder rub off as you help them out things in context. Yes we most certainly do forget! I love the way that God will, on my worst days, have such an incredibly clear sky for me to gaze at and remember His wonder! We need to get unbusy in life and slow down! These times never come again… Thanks for the reminder! Things that fill me with wonder: quiet early mornings sitting by a sunny window with a cup of coffee; daffodils; my children’s creativity; and more. Wow, inspiring post! Love the 7 wonders story, that is so true. We need to bask in the wonder of all God has created. We get so caught up in our to do lists that we forget to enjoy the moments as well. Thanks for the reminder! Oh, wow. I love the quote from that boy about the 7 wonders of the world. It needs to be framed! I love photography so I am guilty of snapping pictures. Maybe too much! I wanna curl down. I’m so guilty of the “snapping too much photos”. After I learned how to manipulate my DSLR, I never stopped using it. I enjoy beautiful shots, creative photos and printed memories.. But I forgot about being present in those memories. I was busy looking for the right angle that I forgot to pause and fly with my fairy child… Thanks for this reminder. It’s amazing and so true! Children always know best because they see thing so simply. I love that one about the seven wonders of the world, never heard it before, it’s lovely! Thank for the post. I am reminded of childhood and simpler days. We can have that we just need to unplug and do something like that for ourselves. This is a reminder when childhood days was spend playing out side now kids are playing on cell phones and computer. Hopscotch & Jump rope was the in thing. Great blog post. Lovely post! Also, thanks for sharing with us the Link – up! I love this kind of link parties so much! Kiss you! Your right. Thank you for the beautiful reminder. Ugh. I’m so guilty of this. Even tonight as I was rocking my baby girl to sleep, rather than being present with her, I was on my phone checking Facebook and reading blogs. It’s not so much a loss of wonder as it is an obsession with technology. This week I’m going to put my phone away more. I think we have lost a sense of wonder too! God created this world and we have lost a bit of wonder of what all is involved with that for sure! One of the joys of being a grandmother is seeing the world through the eyes of a small child again. They see the wonder in the world in everything around them. They learn every day and I get to watch them learn! It’s WONDERful! You hit the nail on the head. As a travel blogger I have to constantly remind myself to live in the now, savor the moment, and look with eyes of wonder at our amazing world. It can be found in the majesty of the Grand Tetons, but also in the eyes of a child . . . .
Just seeing the title of your post made me say yes, we absolutely have lost our sense of wonder. Your insights brought that agreement into further clarity. I love your use of relevant quotes and anecdotes. Thanks for the reminder to see the world anew through the eyes of a child. Great reminder! I have such a hard time trekking through the day-to-day of parenting small children that I often forget to stop and marvel at the beauty around me! My beautiful children, nature, laughter, tiny miracles all around us. The last year or so I have been really trying to stop and slow down more often, but it has been a real challenge. I think God is reminding me through your blog! OH! My dear. You have pulled at my heart strings! Although I am guilty of snapping pictures myself, I am a selfish woman who likes to capture every moment to review and look back on later. However, living in that moment and soaking it all in is so amazing! 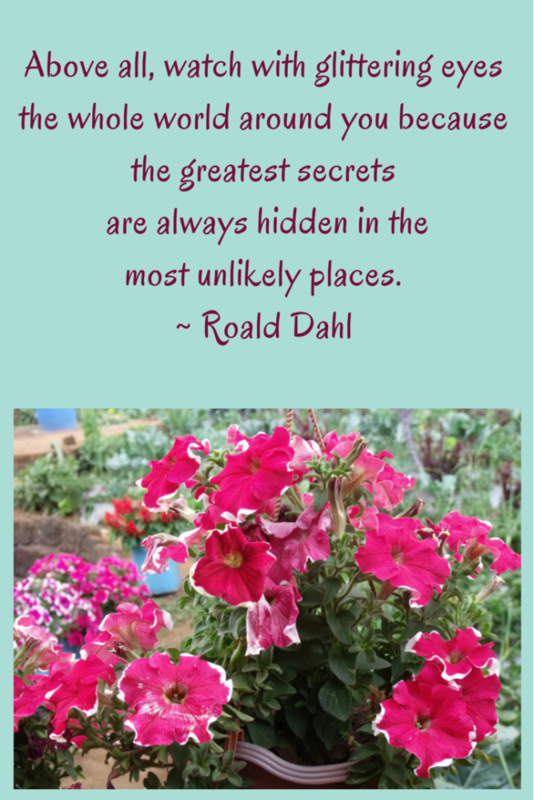 I especially love the Roald Dahl quote. I do think we’ve lost our sense of wonder. My life is so busy and fast-paced that I rarely take the time to just experience wonder. Thank you for the reminder to do that more often. I think I understand what you are saying. But, I do think it is still possible to have a sense of wonder AND take pictures. I take pictures BECAUSE I have a sense of wonder. I am in awe of what I see, and want to share it with others. Does that make sense? But, I do believe we need to have a good balance, if that is the whole premise of your post. Mmm….wow, great reminder! Thank you for this post. YES!! We have lost our sense of wonder. With the internet, we can google anything we want at lightening speeds, but very rarely do we take the time to ponder, savor and enjoy REAL LIFE moments and to just be still and grateful for everything around us. Thanks for the reminder to find our sense of wonder again! Thanks for the reminder to keep a sense of wonder. I’m not sure I’ve actually lost mine, but it does at times seem to get buried a bit. Great post written beautifully. I think as we age, life gets in the way and we forget to just love the simple things. I appreciate the reminder to look beyond what it seems to what it is. “I just stand there and shine.” I just loved that quote. I am sick of the whole cell phone and technology issue. People wonder why kids dont have friends or go outside and play – well, because video games are the baby sitter. Childhood obesity is at an all time high. My husband and I fight a lot about use phone use. When he gets up in the morning, instead of a good morning, I see him looking at his phone checking his latest Facebook feed. And he’ll do that for hours if you let him. When we are having family time, you can usually find him off on his phone. We go do things together, hes checking his phone. No exaggeration. He’s addicted. What ever happened to the human voice and contact? It just makes me sad because I know so many others out there are like me and dealing with this or are like him and addicted. I have been working on my sense of wonder here lately. It has been amazing the things you see when you take the time to look. The other night I was taking out the trash and by looking up I saw a beautiful blackish-blue evening sky with the biggest, fluffy med gray clouds that filled the sky. Most thought provoking post. I have been trying to make a conscious effort to take note of and appreciate all that is around me. Sometimes it is only the dirty and melting snow….. but it has to be warmer to do that… something positive. I have to admit over the years I’ve developed a serious problem with this. Before smart phones, I spent most of my time viewing life through the lens of a camera. Now, it’s a quick selfie, a few snaps for Facebook and I spend the rest of my time texting about what’s going on. I definitely need to be better about that. Lovely article; it’s given me quite a bit to think about. What a thought-provoking post! Is it really that difficult to experience the awe and wonder of creation? We, parents, need to encourage and train our children to do this. It’s not something one learns from sitting in front of a screen, but is learned by doing. For instance, I love to go to the lake to walk, most of the time by myself. However, I need to be listening to something while I walk, whether it’s music or a recorded book. I still take in the wonder of the lake and the fauna and such but what I’m listening to makes me feel like I’m not alone. I was thinking along the same lines as Mitch–technology is a great tool and can augment a sense of wonder! All things in moderation, of course, but I’m hesitant to vilify the tech that makes my pretty cool life possible! I love this article! I think that it is so rare that we turn off our smart phones, put down our computers, and stop and smell the roses. I really plan to do more of that this year with taking long walks, breathing in cool air, and enjoying seeing the spring flowers come into full bloom! Every so often, I read a book or magazine that somehow makes the beauty of everyday moments click into place, and the mundane isn’t so mundane anymore. That’s a sense of wonder to me. I enjoyed your stories that illustrated the point of how important our feelings and experiences are. I agree that it is sad when we get caught up in the technology of capturing those special moments and lose some of the thrill of experiencing those moments. For me, the photos are to help me remember those special times, and I am not certain that I can collect hose memories without photos. And, like everything else, it is a matter of finding the balance between too much and too little. Thanks for the thought provoking post. Oh I get that, Laurina. I take photographs too – but like you said, it’s all about finding balance! Yes! I think most kids and even myself have lost our sense of wonder. We are so involved in electronics that we don’t take time to look outside of them. The beautiful wonders of the world. You definitely gave me something to think about! I loved this. It makes me so sad to see little kids immersed in electronics all day long. Send them outside, make them play with toys, use their imagination. I’m a part time nanny for a 7 year-old and all he wants to do when he gets home from school is play on his tablet. His younger brother and sister just want to play with him. I hope I never loose my sense of wonder either. Oh, I know just what you mean, Ellie. I see too many kids that way these days! What delights me is watching children play creatively! Yes, children have 100% lost the sense of wonder! None of the kids I know like to play outside. All they want to do is play video games, go on computers, or text friends. It is so sad that they don’t enjoy nature like I did when I was little! Isn’t that so sad! Thankfully, there are parents who still ensure that their kids play outdoors! I hope I am not losing my sense of wonder, as it’s one of the things that makes life worth living! Thank you for the reminder in this inspirational post. We are losing our sense of wonder, and, sadly, many children are losing it earlier and earlier in life. They are parked in front of the TV or a DVD as little ones, and when they are older, they sit in front of a computer, play online games or communicate with others via their cell phones. I will vow never to lose my sense of wonder. That will join my word for this year, “DIFFERENT”. Been walking an hour a day this week and noticing all sorts of great views that I usually miss. Has been such fun and I’m already missing it when I don’t get out during the sunshine hours. Finally re-connecting with nature is feeling good! Oh, I love that second story of the wonders of the world. Adults have become so jaded in so many ways. I hate being in a hurry or being single-minded, but in many cases it can’t be avoided. That’s why I try, as often as possible, to stop an examine the earthworms and ants with my kids. “Wonder” is my word for the year, Corinne! I was so thrilled to read your post today, reminding us to NOT lose our sense of wonder ever. I truly believe it keeps us young and in closer touch with the Almighty. You’re right about us losing our sense of wonder. But then occasionally something happens that reminds us to take a step back, take a look and wonder at the wonder of it all! William Wordsworth said…’child is the father of man’! It seems to be all the more relevant in this tech driven world. I love that innovative answer of the child and yes, modern youth has no time ‘to stand and stare’. Even I wonder what is so important that can’t wait till people finish their walk…probably they pretend to be busy! Thanks for highlighting such an important issue of modern times, loved reading it Corinne. Living an almost secluded life inside a hospital, no one knows better than me the need to reconnect with nature and take a break from social media to find a part of our humanity and inner exuberant child once more. We have lost a lot as we have grown up – I don’t know. Perhaps it is the realisation that life can be a dark place that clouds out the happy rays of sunshine we could so easily see once as a child. yes, we are loosing our sense of wonder slowly… especially the youth of today who are so tech-savvy.. i seriously don’t like my friends spending all their time on Whatsapp and hike.. or play games like ‘bingo’ and ‘clash of clans’ glued to their smart phones.. once upon a time smart phones awed us all.. but now if you don’t have a smart phone you lag behind..
A timely post. Thanks for reminding us to put up our smart phones and look around us! Yes! I have always loved being around children and I used to teach preschooler before having my own kids. I think part of it was always because I loved seeing the world through their eyes – so innocent, unjaded. I love this! My grandma taught my mom to keep her sense of wonder, and in turn my mom taught my sister and I, and now as my son is getting older I am teaching him the same. I can recall sitting at the kitchen table with my grandma as a summer storm rolled in, watching the rain fall and lightning strike and getting lost in cloud formations- ones that looked like bears riding bikes or dragons. These days when taking walks with my son we can be found smelling the flowers, catching ladybugs, and sometimes even crouching down watching an ant make his merry way back home from a journey that we undoubtedly make a silly story about. Absolutely beautiful Corinne and I am truly the first guilty of being on social media a bit too much, but do agree that we need to try better to enjoy all the absolute wonder and joy around us daily. Thank you so much for linking with us and am with Marcia and hope you will continue to join us for weeks to come now. 😀 The more technology we have, the more we lose our sense of wonder. I try my best not to get caught up in it unless absolutely mandatory. Reminds me of those lovely days in my childhood when libraries were our favorite hangouts – among the bookshelves. Now, with the internet, while it is easier to find info, nothing beats the feel of a book and the togetherness of friends. 🙂 No, I like to think I haven’t lost my sense of wonder! Lovely post, Corinne! I have very recently realized that I get to caught up in my life to live. Thanks for the idea of realizing our on sense of wonder. It is definitely time to take it back.